Something is not quite right about the new Snapchat update. In order to use filters on your images, you now have to hand over your location data. If you attempt to use a filter by swiping right on the Snap you have just taken, nothing will happen. You either allow Snapchat permission to access your location, or you don't get to use any of their filters. 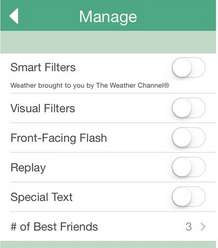 This sneaky permission comes directly from the My Weather Channel filter, which adds your local temperature to your Snap. However, none of the other filters are accessible without turning the location service on. @_24hr60sec1min nope - just providing more interesting filters - we don’t track your location! This new update seems to be going against the very concept of anonymity that Snapchat was built on. The new update forces location data to be shared for optimal user experience, created a very easy to screenshot messaging screen, and no longer allows the user to clear their feed automatically. Hopefully, Snapchat is using location services only for the filters, rather than planning to turn a profit on their users data. We reached out to Snapchat for comment, and will update this story if and when we get a response.